One of of today’s keynote speakers at the Web 2.0 Expo in San Francisco is Adobe exec Kevin Lynch, who serves as the company’s CTO and SVP, Experience & Technology Organization. The keynote talk is a timely one — Adobe has been in the headlines over the last few weeks as it engages in a very public battle with Apple. 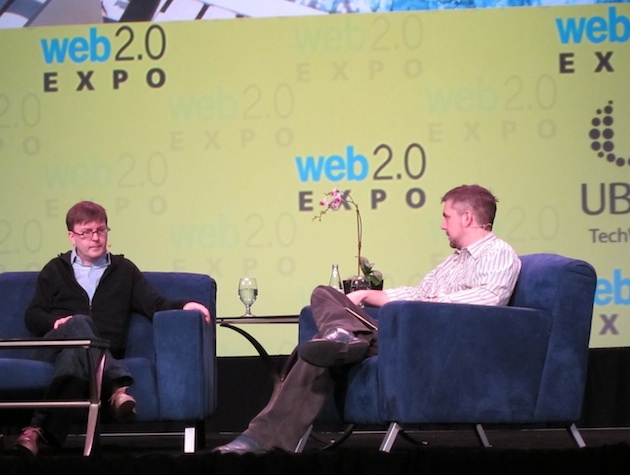 Lynch sat down with Web 2.0 Expo SF program chair Brady Forrest. My live notes about the conversation are below. Q: How is Adobe going to react to HTML5? A: I wouldn’t say reacting to HTML5. We see whatever people are using to express themselves. … We’re going to make great tooling for HTML5. We’re going to make the best tools in the world for HTML 5. It’s not about HTML 5 vs Flash. They’re mutually beneficial. The more important question is the freedom of choice on the web. But look at the iPhone helicopter we just saw — why should I only be able to use an iPhone for that? Why can’t you do that with any phone? If you look at what’s going on now, it’s like railroads in the 1800’s. People were using different gauged rails. Your cars would literally not run on those rails. That’s counter to the web. The ‘rails’ now are companies forcing people to write for a particular OS, which has a high cost to switch. The technology issue I think Apple has with us is not that it doesn’t work, but that it does work. We don’t want to play technology games when Apple is playing a legal game. We’re focusing on everybody else. There’s a huge wave of innovation, there’s going to be a wide range of devices. We’re working through the Open Screen Project. Have over 70 partners working with Adobe on that. There’s a lot of great devices coming out over the course of the second half of this year and next year, going forward. All the innovation coming from all those companies will dwarf what’s coming from that one company that isn’t participating. Regarding the prototype tablet that has been shown off at Web 2.0, there are a bunch of manufacturers building devices with those guts. Q: How is Omniture going to play out? A: I think everyone agrees the experience matters. But you also have to optimize how effective it is — that’s what Omniture is about. Test&Target for multivariate testing. Test different colors, button locations. We’re also going to further extend what we offer devs. As people build applications, we’re offering something that will let them integrate with social networks. We’re also developing a service to do transactions (Try&buy).